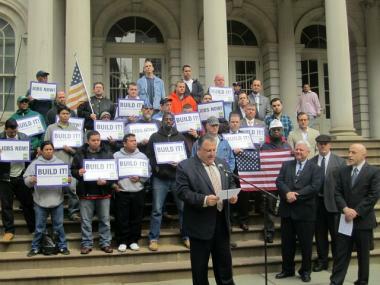 Local 79 Construction and General Building Laborers member Jose Chicas said he backed NYU's plan because construction workers need the boost it would provide. LOWER MANHATTAN — In the face of months of opposition to NYU's proposed 20-year expansion plan by many Greenwich Village residents, more than 20 laborers, a construction trades council and the Greenwich Village-Chelsea Chamber of Commerce made their case for the project on the steps of City Hall Tuesday afternoon. The Building and Construction Trades Council of Greater New York, GVCCC and construction workers urged Manhattan Borough President Scott Stringer to approve New York University's plan because it would provide construction jobs, expand the city's tax base and boost local businesses, they said. "We're here today asking Borough President Stringer to recognize that NYU's growth strategy is an essential part of securing the financial future of small businesses in Greenwich Village," GVCCC president Tony Juliano said. Building and Construction Trades Council of Greater New York president Gary LaBarbera said he supports NYU's 20-year expansion plan because it will create construction jobs. The NYU 2031 plan — which would add four new buildings to the two large blocks bordered by LaGuardia Place and Mercer, West Houston and West Third streets — will create an additional 2,400 jobs for the next 20 years and generate more than $490 million in economic output, according to to GVCCC's estimates. "It's good for the city, good for the borough and good for Greenwich Village," Juliano said. Trades council president Gary LaBarbera led the workers in a call-and-response chant of "What do we want? Build it! When do we want it? Now!" and said that his group has arranged with NYU for the jobs created through the construction to go to members of his group. "We have a commitment from NYU that they will use our members for the project," he said. "They will give good-paying jobs for our members." 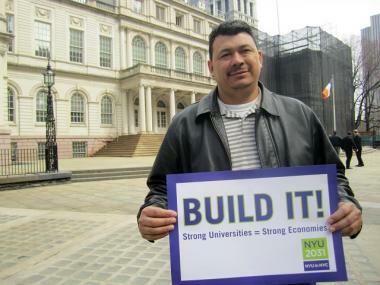 Jose Chicas, a member of the Local 79 Construction and General Building Laborers union, said he backed NYU's plan because workers need the boost. "We support the expansion of NYU because it will create jobs, period," he said. Stringer is due to issue an advisory vote by April 11 on the rezoning application NYU has filed with the city to proceed with the project, which is currently undergoing the Department of City Planning's seven-month, public land-use review process. Community Board 2 unanimously voted the project down Feb. 23, stating that it would change the character of historic Greenwich Village and compromise quality of life during 20 years of construction.